An international team of astronomers including members from the Niels Bohr Institute have used a short but intense light from a distant gamma-ray burst to investigate the composition of matter in very distant galaxies. Surprisingly, it turns out that some galaxies in the early universe were richer in elements than our Sun. The observations have been published in the scientific magazine, Monthly Notices of the Royal Astronomical Society. space using satellites, which locate their precise position, after which large ground-based telescopes can study their light in detail. The gamma-ray burst, GRB 090323 was first discovered by NASA’s Swift satellite, then picked up by the GROND telescopes in Chile and subsequently studied in detail using the European Very Large Telescopes, VLT in Chile. 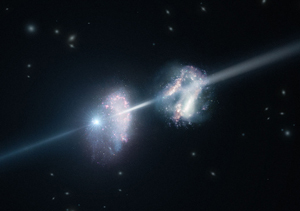 Observations with the VLT showed that the intense light from the gamma-ray burst had passed through two galaxies lying close to each other, with the explosion taking place in one of them. The two galaxies are seen 12 billion years back in the history of the universe, thought to extend over approximately 13.7 billion years. “Such distant galaxies in the very early universe can rarely be observed. The powerful light from the gamma-ray burst highlights star forming regions, which cannot otherwise be explored and functions as a powerful tool for studying the element content”, explains Thomas Krüehler, astrophysicist, PhD, at the Dark Cosmology Centre at the Niels Bohr Institute, University of Copenhagen. The elements are formed in the stars from the star’s red-hot hydrogen gas. The hydrogen atoms fuse together inside the stars into heavier and heavier elements and in the fusion process the star emits light radiation and thus energy. When the star explodes and dies, the matter is flung out into space, where they become part of the enormous gas and dust clouds that can form new stars. For each generation of stars, the gas clouds and the stars become richer and richer in heavier elements. “According to expectations, the galaxies in the very early universe should not have yet been able to create so many heavy elements, so we were very surprised to discover that these galaxies had a higher content of heavy elements than our own Sun”, explains Thomas Krüehler, who was responsible for the collection of data and has had an important role in the evaluation of the scientific results that can be extracted from the observations. 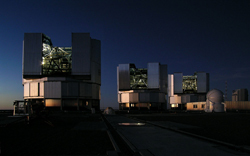 The two distant galaxies in the very early universe were studied in detail using the European Very Large Telescopes, VLT in Chile. “Our detailed studies of the gamma-ray bursts show that some galaxies were already rich in heavy elements and metals very early in the development of the young universe, only two billion years after the Big Bang”, he says and explains that measuring for metal content in distant galaxies is a very difficult observational challenge, but it is essential in understanding cosmic evolution. The build-up of metals is one of the most fundamental processes in understanding the structure and development of galaxies and how galaxies like our Milky Way were enriched with heavy elements. Thomas Krüehler is looking forward to being able to use the new astronomical instrument on the VLT, the X-shooter, which was partly built in Copenhagen. This instrument will allow them to study such events in the young, distant universe in even greater detail. Dark Cosmology Centre (DARK) is an astrophysics research centre of excellence at the Niels Bohr Institute, University of Copenhagen, focusing on the ‘dark Universe’.